How about a large holiday cottage on the Isle of Wight. If that's the type of thing you're after, "Hermitage Country House" could be the place for you. This country house sleeps 22 people in 12 bedrooms, so is perfect for a getaway. All the bedrooms at Hermitage Country House are en suite. And for those with a dog as part of your holiday, you'll be pleased to hear that Hermitage Country House is pet friendly too. There are plenty of TVs and DVD players around too - so you can spend time with your friends; but you can always get a sometime to yourself to catch up of East Enders! An open fire and wood burner make this a cosy accommodation to spend a winters' break. Other facilities include Wi-Fi; washing machine; tumble dryer and dish washer. Outside you've got over 12 acres of grounds to explore. With a patio and furniture to enjoy a sit down. Hermitage Country House is set in a rural location, so you can take yourself off for some walks in the countryside; or bring your cycle, and bike around the island. The towns of Ventnor, Cowes and Shanklin can all be easily driven to - mind you, the Isle of Wight isn't too large, so you can venture to all corners of this island. To keep the children entertained during your holiday, you can visit "Blackgang Chine", or how about "Dinosaur Isle". 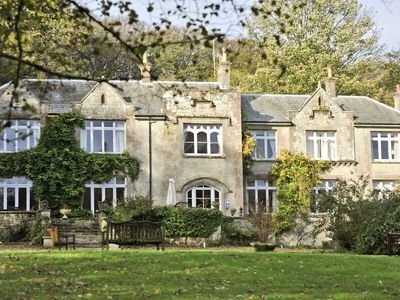 Holidays at Hermitage Country House start on a Friday, with short breaks being available throughout the year - so you can get away to Hermitage Country House for a weekend break.